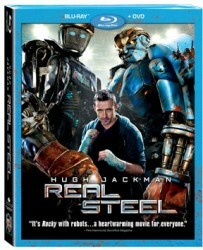 DreamWorks Studios’ Real Steel, starting Hugh Jackman, muscles its way into the Home Entertainment arena on Blu-Ray, DVD, Digital and On-Demand on January 24, 2012. This visually stunning action-adventure filled with heart and soul is a “must-add” to every home movie collection, delivering a premium in-home experience complete with knockout bonus materials that dive deeper into the action. For more on what you can expect from Real Steel, visit www.steelgetsreal.com.